This baseball game is the hottest inflatable game around. The ball floats in mid-air while you prepare to hit it out of the ballpark! Try to hit the ball as hard as you can and get it into the targets on the inflatable. Kids love this inflatable baseball game. 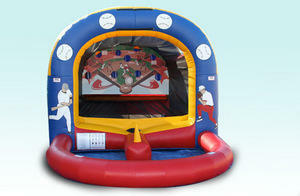 This is perfect for baseball tournaments, school carnivals, and church events.